Michael Bay naysayers should exercise their lips and jot down a fresh set of rants, because the next film in the Transformers franchise - Transformers 4 for now – has already started principal photography, so there’s no chance of him getting out and doing a Pain and Gain sequel or anything. 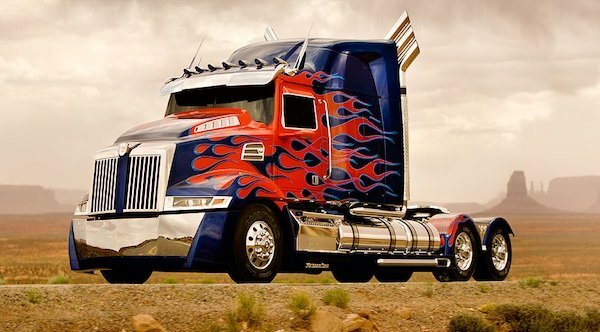 For everyone who has for years been pissed off over Optimus Prime’s front end not being a flat-nose, you won’t get your wish fulfilled here, but the front end looks like it’s maybe six inches shorter, though the rear portion of the cab is now raised about a foot or two above everything else, with the chrome exhausts lined up against the back of it. Really, from grill to hood to headlights to flame design, everything about the new truck is updated and flashier, trading edges for a more rounded look. I’m just assuming the other side of the cam isn’t painted green and orange, and that there isn’t a mural of Michael Bay painted on the back. Starring Mark Wahlberg, Kelsey Grammer, Stanly Tucci, Niolas Peltz, Jack Reynor, Sophia Myles and T.J. Miller, Transformers 4 is set to hit theaters June 27, 2014.